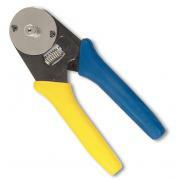 Detailed listing of our telecom crimpers. 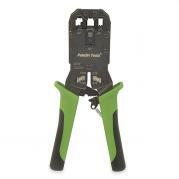 This Paladin All-in-One Modular Plug Crimper does everything from CAT-3 to CAT-5e! 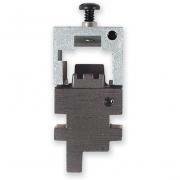 All-in-one crimping tool for Western Electric (WE)/ Stewart Stamping (SS) type, 4-, 6- and 8-position modular telephone plugs. Crimps 4- and 6-position RJ11/RJ12 connectors. Crimps 8-position RJ45 (non-keyed). Crimps AWG 28-24 telephone and data cables. 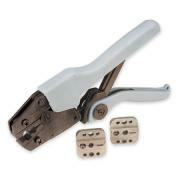 Includes embedded cable cutter and stripper all in an ergonomically cushioned ratcheting frame. Built-in safety ratchet release. Comes with a five-year manufacturer warranty. Terminates 2, 4, 6 and 8 Pin Plugs. This tool makes fast and easy work of terminating most manufactured telecom plugs. It features two built-in crimping dies for 2, 4, 6, and even 8 pin plugs. A cut and strip blade has been incorporated for an all-in-one tool. Compact size makes it perfect for tool kit use. 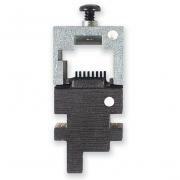 The Ideal Telemaster Crimp Tool is designed to crimp both RJ11 and RJ45 connectors. 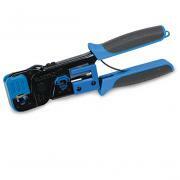 This crimper is compact and constructed of steel to provide long-term durability. 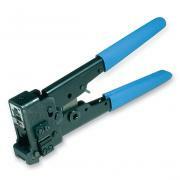 Crimping tool will crimp primary modular plug strain relief only. Make fast and easy high quality crimps single handed with Xcelite's Ergo Crimper, one of the most advanced crimping tools available. With its new patented design, the ratcheting Xcelite Ergo Crimper delivers up to 50% better mechanical gain than other crimpers, increasing productivity and reducing operator fatigue. 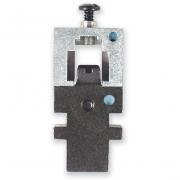 The Ergo Crimper's easily interchangeable dies make it an affordable solution for telecom installers and contractors terminating high speed coax cross-connects. Multiple applications include high-speed telecom (T1 and DSX), CATV, satellite TV connectors and cellular phone tower connection. This 1-pound crimper measures 8.66" x 2.83". 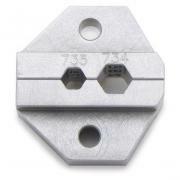 The 734/735 BNC crimp die is a full 1/2" wide to crimp the entire length of the BNC sleeve in a single crimp cycle, thus improving cable retention and performance. This die has hex cavities of 0.255" and 0.178" and also embosses "734" or "735" onto the crimped sleeve providing permanent documentation of proper installation. This AT&T 734 LCC coax cable die has three nests, the first crimps the outer sleeve, a second for trimming the center conductor and a third for crimping the recessed center pin. 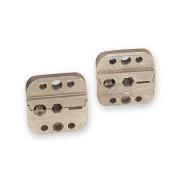 Made of durable machine hardened steel for precision crimping and long lifeApplicable connector types include coaxial 734 BNC, TNC, and 734 LCC connectors. Trompeter-style 75 Ohm mini-BNC crimper is designed to securely crimp solid barrel center pins for BNC/TNC and long pin mini-WECO connectors. Features 12-point indent, full cycle ratchet, built-in pin and socket locator and comfort-grip handle. 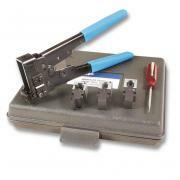 Designed for Telecom installers, this AMP Modular Plug Crimper Kit contains our best modular plug crimper frame, RJ45 die, RJ11 die, 4-position hand set die and small slotted screwdriver in a blow molded carry case. 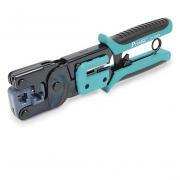 Our best modular plug crimper, this tool crimps, strips and cuts in one tool. This convenient ratcheting crimp tool terminates modular plug connections, crimps both flat and round cable, cuts and strips flat wire. Features interchangeable color coded die and cushioned handle. Overall tool size is 7". One year warranty. The Best Cat5 Crimper You Can Buy! Crimps and strips in one tool. This convenient ratcheting crimp tool terminates modular plug connections, crimps both flat and round cable, cuts and strips flat wire. Features interchangeable color coded die and cushioned handle. Overall tool size is 7". One year warranty.